Affectionately known by the locals as the ‘City of Sails’, Auckland was recently chosen by travel guide, Lonely Planet, as one of 2014’s Top World Cities and it’s not hard to see why. With a vibrant cultural scene, remarkable history, fantastic shopping and picturesque scenery, Auckland is an essential port of call for any traveller visiting the Land of the Long White Cloud. 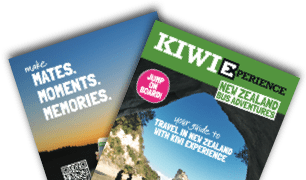 Indeed, Auckland is one of the main starting points for all Kiwi Experience adventures and is a great appetizer of what the rest of New Zealand has to offer. Originally settled by Māori around 1350, the region was known as Tamaki Makaurau (‘Isthmus of One Thousand Lovers’). Māori folklore in the region tells of a battle between two iwi (tribes) over a stolen princess. The war between the tribes so enraged Mataaho, the Guardian of the Earth that he and his brother, Ruaumoko, God of Volcanos and Earthquakes opened up a huge chasm in the earth and swallowed the warriors of both tribes. The supernatural event is said to have created the Isthmus and Auckland’s two harbours, leaving the region resource rich and fertile. Geologically, the region’s rich soil was the result of local volcanic activity from Mount Albert and Mount Eden. As a British colony, Auckland was chosen to be New Zealand’s capital in 1841 after the Lieutenant-Governor of New Zealand, William Hobson, decided to forge a new settlement that was independent from the main European settlements around the Bay of Islands. He named the capital ‘Auckland’ after George Eden, Earl of Auckland. However, the town of Wellington took over as capital in 1865 during the gold rush period. 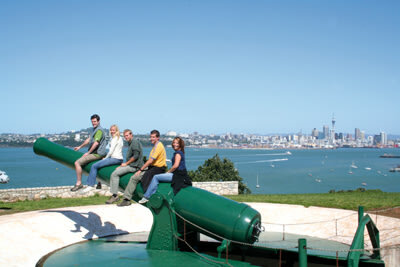 That said, Auckland continued to grow as major trading city into the 20th Century, thanks largely to its working harbour and naval enterprise.The arrival of Europeans to the region in the early 19th Century indirectly brought destruction to the balance of power amongst the local Māori settlements. The Europeans traded muskets with the tribes in the North Island. These tribes then used the weapons against their traditional Māori rivals to devastating effect. In 1985, the Greenpeace ship, Rainbow Warrior, was sunk by French Intelligence agents as it was docked in the Port of Auckland. The ship had been protesting French nuclear testing at Mururoa Atoll. Today, Auckland is a cosmopolitan melting pot of cultures with a huge diversity in art, music, cuisine and festivals. It is the world’s largest Polynesian city but also has influences from Europe, China and India. Heading back to the city centre, make sure you check out the gardens in the Domain and one of New Zealand’s most spectacular historical buildings – theAuckland War Memorial and Museum. Entry is free for residents and $25 for non-NZ residents and you can get up close and personal with the art, treasures and culture of the local Māori people.One of the best ways to see the sites of Auckland is on the water. Hop on a 12 minute ferry ride to Devonport and explore the abandoned tunnels and fortifications of North Head. If you are feeling fit, a short hike to the summit you will reward you with incredible 360-degree views of Auckland City and the Hauraki Gulf – a perfect opportunity for a group photo. Of course museums are not for everyone and if you are looking to get the heart racing, why not climb one of Auckland’s most iconic sites, the Auckland Harbour Bridge. AJ Hackett Bungy will take you on a 1.5 hour tour of the 43-metre high landmark, offering spectacular panoramic views of the city. Adrenaline junkies can then take it to the extreme and jump head first off the Bridge with a bungy-cord strapped to their feet. 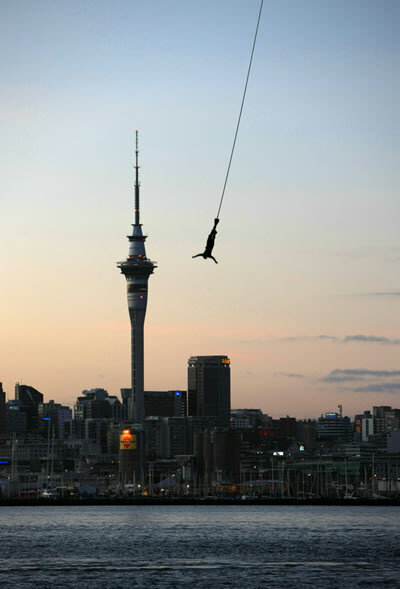 The Auckland Bridge bungy is the only bungee jump in New Zealand that dunks you directly into the ocean. Slowing the pace a bit, the recently redeveloped Wynyard Quarter is another must see on your Auckland itinerary. The waterfront district is the perfect place to grab a delicious lunch or dinner. Check out the Wind Tree sculpture or just watch the super yachts sail by as you down a refreshing Monteiths beer or cocktail from one of the many harbourside restaurants on the promenade. Thanks to Auckland’s cosmopolitan population, there is always something going on and depending on the time of year you visit, you may find yourself experiencing one of the many cultural festivals in the city. In February, experience the enchanting Auckland Lantern Festival for Chinese New Year, while in March, the city plays host to the world’s largest Pacific festival – Pasifika, which brings in visitors from Fiji, the Cook Islands, Tonga and Tuvalu. The Auckland Diwali Festival in October celebrates all things India including aromatic food, dancing and crafts. REMEMBER THAT WITH KIWI EXPERIENCE, YOUR FIRST NIGHTS ACCOMMODATION IS GUARANTEED IN AUCKLAND.